How do you reflect the innovation of a world-renowned innovator AV brand, via a multi-lingual digital platform? The Brief: Christie Digital is a global visual, audio and collaboration solutions company offering diverse solutions for business, entertainment and industry. They’re leaders in film-to-digital conversion and have a strong voice in the tech space. They needed an identity and design for a new monthly e-newsletter, to communicate their news and updates, sharing industry insight with their global audience. A key priority was for it to reflect the wider brand look and feel, while also pushing it to appeal to a mixed user-base, ranging from business clients with technical AV knowledge, to a much broader audience interested in learning how Christie bring to life incredible visual, audio and cinematic moments. Our Solution: JPC devised a sleek, modular style for the platform, allowing Christie total flexibility for the content, layout and theme of future editions. We also created a strong brand identity to ensure a consistent and memorable reader experience. 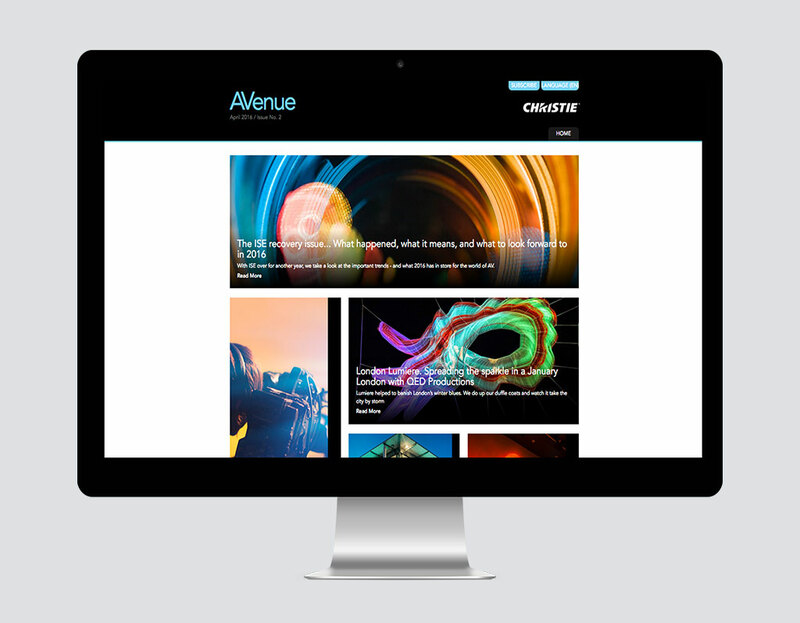 We named the publication AVenue and balanced its contemporary style and interactive features with the innovation and heritage of the main Christie brand and the vibrant culture and people behind it. 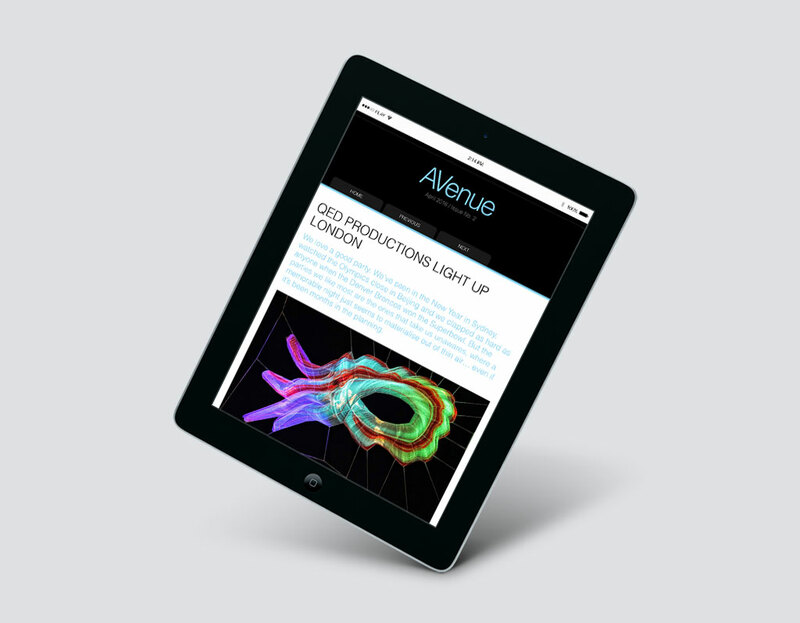 Responsive across desktop, tablet and mobile devices, we recommended that AVenue is hosted on a microsite, with email alerts notifying subscribers when new editions become available. To further encourage a dialogue between the audience and the magazine we introduced features that allowed readers to share feedback and enter into discussions on suggested articles or topics. 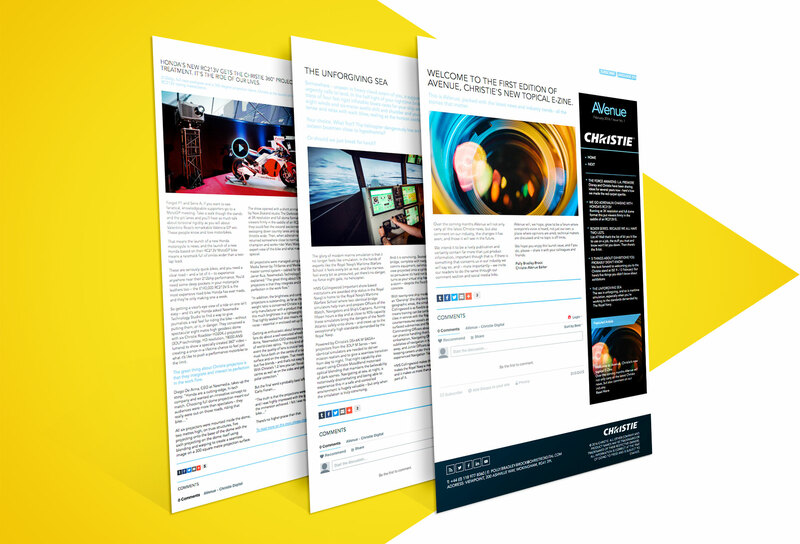 Back-end analytics capture vital insight for Christie into their audience profiles, interests and experiences with the magazine – with the flexible design giving the option to update and customise future editions based on the user feedback, without the need to drastically update the design. In the build-up to the first edition, we designed and produced a pre-launch ‘teaser’ campaign using bespoke digital mailers, in a style similar to the AVenue brand; targeting Christie’s network of clients and followers and directing them to the subscription form. And to ensure total accessibility for Christie’s international audience, we rolled-out all 6 global versions of the magazine simultaneously – with the responsive grid format adapting to accommodate the different requirements.